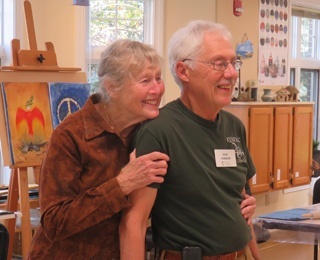 Any tour of Kendal at Oberlin usually includes a visit to the Creative Art Studio, where Don and Joyce Parker are often found at work and play, following Picasso’s mantra. Don is a watercolor painter and Joyce a potter and watercolor painter who also dabbles in acrylic paint, paper mache and fabric. Both teach classes and workshops, and the two rotate the job of chairing the Kendal at Oberlin Residents Association committee that guides the activities in the Arts Studio. “A few people think I live here,” Joyce laughs. “It is really the residents’ space.” The comment they frequently hear is how spectacular the studio’s natural light is. “It’s north light, which is the best for artwork because there are no shadows,” Don explains. The studio opened in early 2015 as part of Kendal’s community space renovation. Joyce and Don say they are very grateful for this space because before the renovation, the room housed mostly horticulture. Art activities were assigned a corner of the room, and there was no storage for art supplies in the cramped quarters. “We used to have summer clay classes in our carport or went to Oberlin College,” Joyce says. The studio is open 24/7 for artwork and is also a spot where informal gatherings occur. “A lot of good conversations go on here. It’s like a little home away from home,” Joyce says. It’s often a walking destination for a few residents from the care center and their caregivers, and occasional staff stop by to look around and relax. But the community space’s mission is serving resident art groups. The spacious studio can accommodate about ten people working at the same time, but usually there are fewer. Residents can reserve space for art projects, and there are storage areas to keep some materials in place for a while. The studio also includes a potter’s wheel and kiln room. The Art Room Planning Committee and administration worked hard on the design and plans for the room. “The architect was very attentive to the community’s needs,” Don says. Don leads a variety of watercolor workshops, including a summer outdoor session at various campus locations and watercolor card making for the holidays. He assists with matting and framing watercolor paintings and has led pencil sketching and perspective classes. Joyce’s clay workshops are varied, from making garden signs to rustic jugs and small bowls, using hand building techniques. “If residents want to use the potter’s wheel I ask them to take classes at FAVA, then I can help them as they continue to learn,” she says. Joyce and another resident are currently the only ones with experience to fire the kiln for the group. A small yearly budget from Kendal at Oberlin Residents Association covers general maintenance, and residents pay a small fee for their supplies. Sometimes making art is secondary, though, with the primary focus of the studio on building and strengthening community connections. Residents dealing with loneliness and illness, for instance, often say the art sessions give them camaraderie and a needed distraction. Two residents meet twice a week to make cards and chat. The outstanding decorations for Kendal’s annual Spring Fling are created by a group of residents who gather around the center table, working several nights a week for two months. The group is organized and led by a dedicated artist. After the fling, some of the decorations are sold to earn money for the Residents Assistance Fund and others are donated to the wider community. The Parkers moved to Kendal from nearby Cinnamon Lake in 2008. 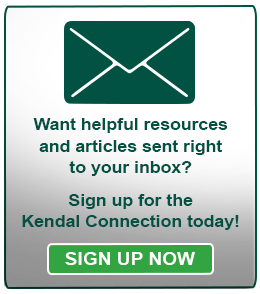 They first learned about Kendal at Oberlin, an active retirement community in Ohio, from Don’s brother, who several years earlier had moved to Kendal at Longwood, located outside of Philadelphia. “We knew no one here, but now we have become a part of this wonderful community and have many friends. What a blessing,” Joyce says. Don is a retired physician and Joyce a former RN, and visual arts have been a part of their lives for many years. Over the years, the Parkers have traveled to many workshops, including the John C. Campbell Folk School in North Carolina. Last summer they volunteered at a church-affiliated fine arts camp for youth. “We told them we could manage it as long as we could get a daily nap,” Joyce says with a smile. 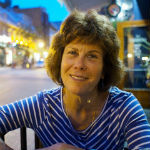 She likes to explore other mediums too, such as papermaking and collages. Recently she designed a group-made banner for the Quakers who gather with community members from Kendal and the city of Oberlin every Saturday in Tappan Square to promote peace and justice issues. When weather turns warm, the Parkers are often outdoors. Don is a former Master Gardener and active with the Horticulture and Arboretum committees, and Joyce maintains plots in Kendal’s community garden, which helps in her floral arranging activities for Kendal and Peace Community Church. Looking for a Retirement Community in Ohio? If you’re interested in Ohio retirement communities that fit your lifestyle, Kendal at Oberlin may be the perfect fit. With an emphasis on art, lifelong learning, wellness and environmental stewardship, Kendal at Oberlin offers residents a vibrant retirement lifestyle. To learn more, explore our blog, contact us online or schedule a tour.